We know what “curse words,” “cuss words,” or “swear words” are when we hear them. While some people reserve them for when they are angry, others just slip them into casual conversation, often without being completely aware of it. In spite of this, I would argue that most of us, if not all, know deep down that using these words is wrong. Or is it? Some would argue that curse words are “just words.” Following the old saying “sticks and stones may break my bones but words will never hurt me,” it is reasonable to propose that words in themselves do not have much power; they are simply abstract thoughts attached to sounds our throats and mouths make, or a collection of characters scrawled or typed on a page. Others would probably say, “Well yeah, once upon a time those words meant something, but now the definitions have changed, so it doesn’t matter.” Words change meaning and connotation all the time, sometimes from bad to good or vice versa. The word “fa**ot,” for instance, at one point meant a bundle of sticks, but today it is most often used as an insult hurled at homosexual individuals. I am of the strong opinion that if a word is or has been recognized as a curse word, we should leave it that way. There is no use trying to reclaim, repurpose, or redefine a word when the better option would be to refuse it altogether. Take the “n-word,” for instance. If it started off as a derogatory, dehumanizing word to describe Black slaves (and eventually their non-slave descendants), I do not agree with Black men calling each other that, putting it in the same category as “friend,” “brother” or “homie”; it just seems foolish and backwards. To make things more complicated, the reclaimed word is not even limited to Black culture anymore; I have seen a Latino boy call his younger brother that, and Asian friends call each other that, just to point out a few examples. Why has a word with such a haunting past now pervaded popular culture? The bottom line is that I do not believe it’s right to curse, yet I admit that lately, even I do. This is due, in part, to spending a lot of time around fellow college students, many of whom do not share the same convictions or inhibitions as me. While I do not use these words in conversation, I do mutter them under my breath, or scream them in my head when provoked by a disgruntling situation. Sometimes I am not even that upset; it could be something small like not knowing where I put my glasses, or my phone acting up, and I ask myself, “Where are my [bleeping] glasses?” or say, “This stupid piece of [bleep].” The worst part is–I can’t lie–I do get a temporary sense of relief and empowerment when I use these words; it’s as if I can feel the steam being released from my ears. However, even if that’s the case, then I have to ask myself, why use a negative outlet for my anger when I could use a positive one, one that would add to my overall self-image and wellbeing, rather than take away from it? I am always reminded of an episode of SpongeBob Squarepants in which Patrick referred to the curse words that SpongeBob recently learned as “sentence enhancers.” On the contrary, I feel that curse words cheapen conversation and weaken the integrity of the sentence that was just spoken. Even some of my professors curse, and while they probably do this to appear relatable, comfortable, or demonstrate that “we are all adults here,” instead it just shows a lack of respect on the part of the speaker for whoever hears them. I am grateful for my engineering drawing professor who made it a policy for us not to curse in class; this was one of the ways he advocated for a professional environment in which we all treated each other with respect. Perhaps, as in many cases, the problem is not the words we use per se. The problem is that we often give ourselves up to self-deprecating behavior. We look for the easy, sleazy, instantly gratifying ways to express ourselves instead of the wholesome, worthwhile, thoughtful ways. Just imagine an employee who does not get the promotion she was hoping for. Instead of releasing the frustration through something she loves, like bike riding or painting, she chooses to drown out her problems by getting drunk that night, and lashes out at her husband. This is a disheartening but very common story. And unfortunately, many of us have not been taught alternatives. Often times, our bad habits are learned behaviors, and our family and friends make the best teachers. To give one example, how many times does an abusive parent breed a child who grows up to become an abusive spouse? For both the parent and child, violence is the only way they know to dispose of anger and rejection, rather than through hobbies, counseling, sports, etc. To make matters worse, we then paint the cheaper, detrimental mode of expression as better because we are afraid to want better for ourselves. 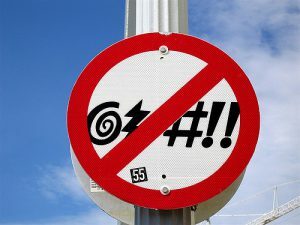 To bring it back to the subject of cursing, if we do not curse or are not O.K. with having a friend call us the “b-word,” we fear being labeled as a “goody-two shoes” or a self-righteous prude. It’s easy to curse because “everyone else is doing it” or “it’s just words” but the reality is, when we do, we prove that we have a limited vocabulary and an even more limited view of ourselves and others. We can keep ourselves in check by asking questions like: “How would I feel if I heard my (future) children use those words? How would my grandmother react to it? Would I expect my prospective boss to hire me if I used those words during the interview?” Sure, these are generalized questions; some people work in an environment that is not as strict, and some people have parents and/or children who curse along with them–but I hope you get the point. Substituting curse words with sound-alike euphemisms is not a long-term solution, but it is a decent place to start. Wean yourself off of F-bombs with “fudge” or “freak,” but as I said earlier, the words in themselves are not the heart of the problem; they are the just the symptom. If you feel like it is acceptable to hurl demeaning insults at someone because he took a parking space (or seat on the train) before you did, then the problem is that you do not value and respect people as much as you should. Furthermore, do you realize that you can damage someone’s psyche without ever letting a curse word escape your lips? Whether you vocalize those emotions or keep them inside, whether you express them with curse words or with scholarly, ostentatious words, your hatred toward someone is just as dangerous and real, and it needs to be handled in a healthy way. So, I encourage you to find healthy ways to express your emotions, whether joy, lovesickness, pain, or anger. Find what you are passionate about and pursue it. 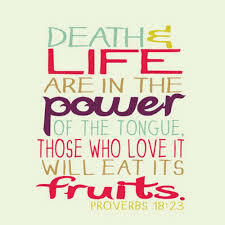 Think before you speak and act. As with any negative habit, it may take a lot of time and determination to break it, but if you watch your mouth, I guarantee that the results will be sweet.